Bananas on store shelves appear to be greener than usual this February. It’s halftime at Coachella, with one weekend down and one more to go, making this a good time to reflect on how something this massive comes together. Booking festivals is a tricky thing. It’s part social science, part data analysis, and part voodoo. Because there is so much worldwide competition for acts during the precious summer months–the number of festivals just keeps growing–promoters have to read a lot of tea leaves if they’re going to put together an event that will sell tickets. That means nailing down bands months and months in advance. But which acts? Here’s where it helps to be psychic. Yes, a promoter will want to secure big-name headliners. Those are easy. You just dangle shipping containers full of money on front of them. But what about the second, third and fourth-tier bands you need to fill out your lineup? This is where the concept of “booking green bananas” comes in. Promoters spend a lot of time looking for acts that they hope will blow up (or be close to it) by the time the festival rolls around. They may be obscure today, but in 6-9 months time, the hope that their career trajectory will have made them household names. This brings us to Cardi B. A year ago, no one knew much about her. Today, though, she’s one of the most-talked-about pop stars on the planet and a highlight of this year’s Coachella. When she was first approached months ago, her people negotiated a performance fee of $70,000 per weekend for a total of $140,000. That seemed like a lot of money back then, but given her current status, she could have commanded a much higher fee. Coachella recognized her as a “green banana” and ended up with a superstar act for a pittance. Meanwhile, Cardi B finds herself in a quandary. Her stage show has expanded with her star status and now tours with a production that costs $300,000 per show. Because she’s committed to delivering a top-level gig to her fans, she has no choice but to spend $600K on Coachella while only reaping $140,000. That’s a healthy loss of $460,000. And it’s even worse when you consider that there are other costs: musicians, travel, roadies, and other staff. In other words, she’ll be down half a million for the opportunity to play Coachella. Let’s talk a look at the 2018 Coachella poster and see if we can’t find any other green bananas. 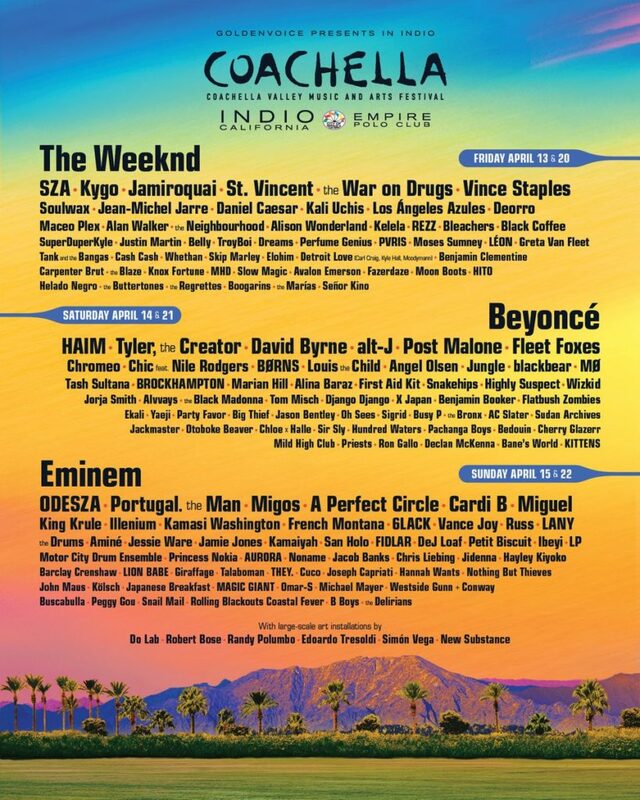 Greta Van Fleet is heading towards something big but at the time they were signed for Coachella 2018, they only qualified to be mentioned in the second-smallest font. You could make a case that Coachella got Sir Sly cheap. Good call, that. On the flip side, is Haim really that much of a draw? Is it just me or have they failed to live up to the hype? Compare this year’s Coachella with previous editions. Organizers made the call that hip-hop and R&B would rule with their audience, so they’ve pivoted away from their traditional rock-based lineup. Turns out they were bang on.